M Ward, thank you for a beautiful new album. You have succeeded where so many other artists have failed. You have created an album with 14 songs worth listening to rather than just a couple of hits held in place with some air filled nonsense packaging tracks. The folksy opening song 'For Beginners' sets the mood, it politely grabs your attention, lays the tambourines out on the floor, massages your shoulders and puts your mind in the right mood to listen the rest of the album which I highly recommend you do. Hold Time has everything from porch folk finger picking guitars (Shangri-La), strutting beats and fuzzy guitars (Never Had Nobody Like You), the most delicate of vocals (Blake's View) and possibly the most gorgeous yet harrowing piece of music (very Pink Floyd) I've heard to close an album in years fittingly called 'Outro'. My only criticism of this album is how short it is, 43:39 mins to be precise. Make your own mind up but I'm giving it a 9/10 and I don't do that very often. If you'd like to listen to Hold Time, npr are currently streaming the whole album for free here. I love npr. 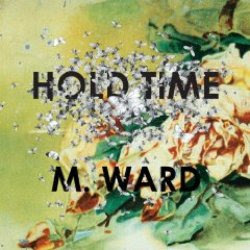 Hold Time was released on Merge Records on February 17th 2009. Chalky, I just neded something to cheer me up, and this album fits the bill perfectly! Thanks. Sure is. This guy is awesome! Sounds like Johnny Cash, Leonard Cohen and J.J. Cale all rolled into one. Great review, I haven't had a chance to stream it yet, but you make me want to buy it... and that's saying something because I've never heard of M. Ward before.